Zamil Steel Buildings Vietnam attended the Diamond Island Convention & Exhibition Center, Phnom Penh, on September 12–14, 2018, for CAMBUILD 2018—the largest building and construction exhibition held in Cambodia in 2018. Cambodia’s economy is growing, with forecasts that it will grow by around 7 percent in 2018, with the construction sector contributing 11.6 percent to the economy. This trend is reflected in the high number of projects granted licenses, with more than 1,600 projects granted licenses in the first six months 2018, and more due in the next few months. The Government of Cambodia predicts that the boom in construction will continue in the next few years, thanks to the kingdom’s political stability, favorable laws, and incentive policies for investors. 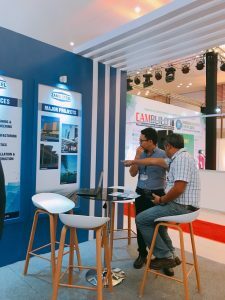 In observing the development trend in the sector, CAMBUILD 2018 aimed to introduce and showcase the latest building and construction technology, processes, and innovations to local construction communities and concerned partners. 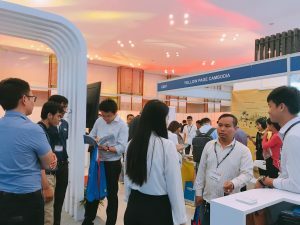 The event gathered together more than 200 exhibitors from different countries to showcase their products, solutions, and services to thousands of industry professionals. Zamil Steel Buildings Vietnam showed their presence at the exhibition with a nicely decorated booth. 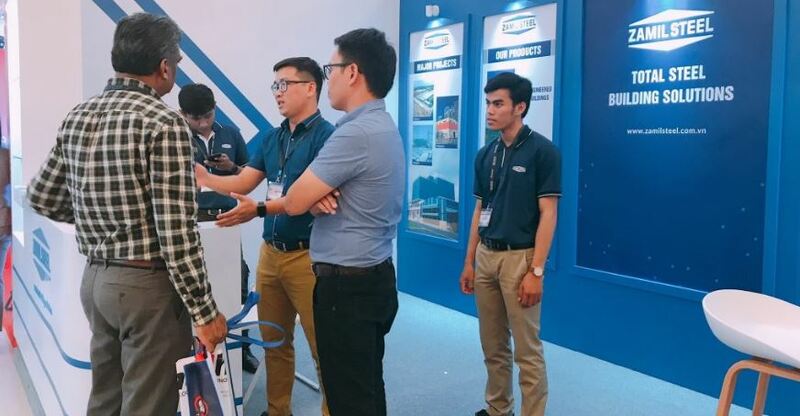 A team of five members from Cambodia Sales Office enthusiastically introduced Zamil Steel’s products and services to hundreds of visitors. The team also discussed with visitors the significant benefits of pre-engineered steel buildings and potential applications in Cambodia. Photos of our existing projects in Cambodia, including the Phnom Penh International Airport and Siam Reap International Airport, were also introduced to visitors. Present in Cambodia since 2005, Zamil Steel Buildings Vietnam is among the top steel building and steel structure providers in the market.